Dwyer’s legal team had argued that the use of this data was unconstitutional. CONVICTED MURDERER GRAHAM Dwyer has won his legal action against the Irish State and the Garda Commissioner over the retention and accessing of his mobile phone records. The Cork-born architect was found guilty of Elaine O’Hara’s murder after a trial in 2015. In his action he sought various declarations and orders which he proposed to use as part of his appeal against his conviction for the childcare worker’s murder. 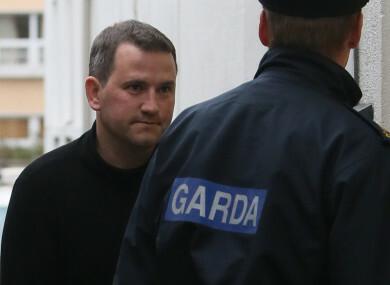 Dwyer claimed that data gathered from his phone, under the 2011 Communications (Retention of Data) Act, should not have been used at his 2015 trial before the Central Criminal Court. The data, which was generated by Dwyer’s work phone, placed the phone at a specific place at a particular time. That data was used to link Dwyer to another mobile phone the prosecution says Dwyer acquired and used to contact Ms O’Hara. The State had argued that the laws that allow the authorities to access and utilise retained data are important in the detection, prevention and investigation of serious crime, including cybercrime, organised crime gangs, murder and terrorism. Today the court ruled that the legislation that allows authorities to retain and access this data is a general and indiscriminate regime that does not meet the requirements of the European Court of Justice and the European Court of Human Rights. In a lengthy and detailed ruling this morning, Mr Justice Tony O’Connor found the Cork-born architect is entitled to certain limited declarations concerning provisions of Ireland’s data retention laws. However he said this ruling does not mean telephone data accessed and retained contrary to EU law used by the prosecution in Dwyer’s trial will lead to the quashing of his murder conviction. The judge, stressing the primacy of European law, found that sections of Ireland’s retention laws contravene EU law and findings of the European Court of Human Rights. He said the European Court had found the fighting of serious crime cannot justify the general and indiscriminate retention regime. Justice O’Connor remarked that the state should tread carefully when trenching upon the dignity and privacy of the human person in the sphere of telephony data retention and access. “Just as crime is required to be investigated there should be transparency of use or abuse of power,” he said adding that notification, supervision and enforceable sanctions are means to limit abuses. “The chilling effect on privacy and the rights of free expression and association by actual feared and mandatory surveillance cannot be underestimated,” he said. The feared abuse of 21st-century surveillance was something that resonated with the dehumanised unpleasant society portrayed in George Orwell’s novel 1984, the Judge said. The judge added that practices of how garda apply for and obtain mobile phone data was not enough to satisfy the decisions of the European Courts in regards to access. He also held that the declarations could not be prospective as the state had argued and could not be suspended to allow the legislature time to enact any new law. Dwyer, he said, is entitled to certain declarations which are to be formally agreed by the parties and will be limited to telephony data and will exclude any effect on the security of the state and the saving of human life. The judge stressed that Dwyer’s legal team had not established that the actual accessing and retention of the data by gardaí was “inappropriate, unnecessary or disproportionate”. This ruling, he said, relates to the potential inadmissibility of this evidence at trial under EU law. This is a very detailed and lengthy judgment in what is a very complex and dynamic area of the law. The Court’s judgment will have to be considered very carefully in order to identify exactly what actions are necessary and the advice of the Attorney General will have to be taken in that regard. It is clear that the current legal framework allowing for access to communications meta-data to combat criminals and terrorists needs to be modernised in light of evolving jurisprudence. He said that the drafting of a new Data Retention Bill is at an advanced stage and “on the Government’s priority legislation list”. “Many aspects of today’s judgement from the High Court are already referenced in the draft Bill and the Attorney General’s advice will be taken regarding further changes,” he noted. Email “Graham Dwyer wins legal action over accessing of his mobile phone data ”. Feedback on “Graham Dwyer wins legal action over accessing of his mobile phone data ”.